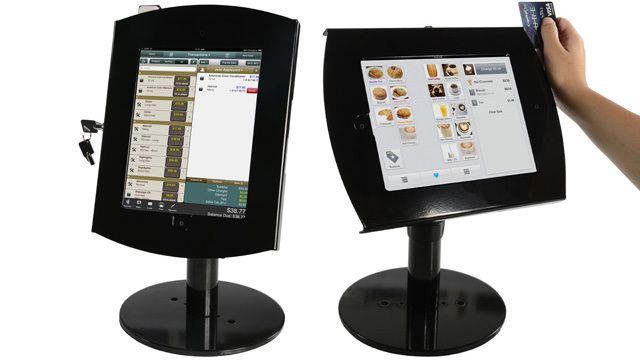 See how you can assemble with iPad display stand with a locking enclosure and card reader! Watch as the tablet case tilts easily from portrait or landscape orientation. TEXT: "Insert the square card reader bracket. Insert the card reader into the iPad. Lock the enclosure with the push lock. The enclosure rotates and tilts for maximum visibility. Knob on post adjusts the height of the stand. iPad POS kiosk is ready to use. Choose an enclosure that leaves the home buttom covered or exposed. Available in black or silver.